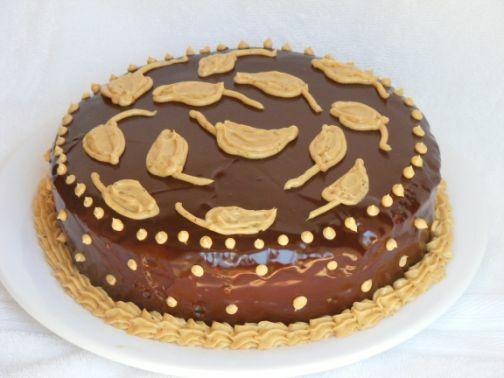 I liked the cake soaked with the simple syrup and apricot glaze very much, but the buttercream – for which I found my own recipe – and the ganache didn’t do it for me. It wasn’t bad, and I certainly ate more than one slice. But this is not something that I’ve craved since baking it, unlike, say, Danish or sticky buns. Though, now that I think about it, I’m not sure I’m an over-the-top decadent cake kinda girl; I pine for simple classics: carrot cake with cream cheese frosting, yellow cake with chocolate buttercream, or maybe even a strawberry cake. The hazelnut brittle and the subsequent praline, however, were to die for. I need to figure out more ways to incorporate those little goodies into desserts. Many thanks to the lovely Chris of the lovely Mele Cotte, who is not just a Daring Baker and not just this month’s host, but full-on Bakenista! Chris, you are always a pleasure to bake with and learn from. For more DB goodness, please visit the blogroll and forum! Place egg whites in a large, clean bowl of the electric mixer with the whisk attachment and beat on medium speed, until soft peaks form. Increase to med-high speed and slowly add the remaining ¼ cup of sugar, over 15-20 seconds or so. Continue to beat for another ½ minute. Pour the warm butter in a liquid measure cup (or a spouted container). Put the nut meal in a mesh strainer (or use your hand – working quickly) and sprinkle it in about 2 tablespoons at a time – folding it carefully for about 40 folds. Be sure to exclude any large chunks/pieces of nuts. Again, work quickly and carefully as to not deflate the mixture. When all but about 2 Tbsp. of nut meal remain, quickly and steadily pour the warm butter over the batter. Then, with the remaining nut meal, fold the batter to incorporate, about 13 or so folds. 4 sticks (2 cups) unsalted butter, softened to cool room temperature In a small heavy saucepan simmer milk, sugar, and vanilla bean if using, stirring, until sugar is dissolved. In a bowl whisk yolks and add milk mixture in a stream, whisking. Transfer mixture to pan and cook over low heat, stirring, until a candy thermometer registers 170°F. Pour mixture through a fine sieve into another bowl and cool completely. In a bowl with an electric mixer beat butter until light and fluffy and beat in custard, a little at a time, until smooth. Beat in 1/3 cup praline (reserving remaining praline for another use) and vanilla extract if using. Put the sugar in a heavy 10-inch skillet. Heat on low flame for about 10-20 min until the sugar melts around the edges. Do not stir the sugar. Swirl the pan if necessary to prevent the melted sugar from burning. Brush the sides of the pan with water to remove sugar crystals. If the sugar in the center does not melt, stir briefly. When the sugar is completely melted and caramel in color, remove from heat. Stir in the nuts with a wooden spoon and separate the clusters. Return to low heat and stir to coat the nuts on all sides. Cook until the mixture starts to bubble. **Remember – extremely hot mixture. ** Then onto the parchment lined sheet and spread as evenly as possible. As it cools, it will harden into brittle. Break the candied nuts into pieces and place them in the food processor. Pulse into a medium-fine crunch or process until the brittle turns into a powder. To make paste, process for several minutes. Store in an airtight container and store in a cool, dry place. Do not refrigerate. Blend vanilla and liqueur together and set aside. Lift the cake by sliding your palm under the cardboard. Holding a serrated or very sharp knife with an 8-inch blade held parallel to the sides of the cake, trim the sides so that they are perfectly straight. Cut a slight bevel at the top to help the glaze drip over the edge. Brush the top and sides of the cake with warm apricot glaze, sealing the cut areas completely. Chill while you prepare the ganache.